I'm kind of in a love-hate relationship with this vest. I always thought the colors and pattern were cute but was able to steer clear of it last year when J.Crew first released it ... because a gal only needs so many puffer vests, right? Well then they re-released the same cute pattern this winter and threw in a promo - and add that to a gift card I already had - and well ... I caved. Even though I don't need another puffer vest ... and actually don't prefer the flap pockets and now-missing the two-way zipper of the redesigned vest (Factory still carries the older style puffer). But the pattern got me. 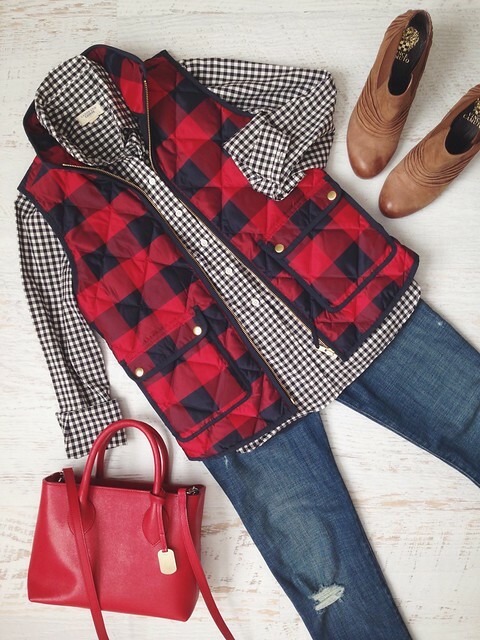 And the overall style is just the right kind of preppy-lumberjack I like. And of course the $%$%$% off. You've got me again, J.Crew, well played. I was so tempted to pick up this vest too but resisted since I have the factory version in the gingham print in the same color way. Cute flat lay! Ah that's a cute version too - I think I can officially say that I am full up on puffer vests now, I'm set!